« Signs a Tree is About to Fall? When you hire a landscaper or tree removalist to cut down trees on your property, the quoted price usually only includes the chopping down of the trees, not the removal of the base or stump. This task is usually left to the property owner, and is a back-breaker to say the least! You can use all means of equipment to try and dig deep enough to pull the stump out, only to end up with a large hole and the stump still firmly embedded in the earth. You need a professional; someone who knows how far to dig and which way to grind to get that stump out easily, and save your back and precious time in the process. Armac carry all the necessary equipment and experience to remove stumps efficiently and safely, with a minimum of fuss and for an affordable price. 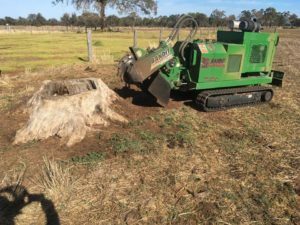 They know everything there is to know about stump grinding and can answer all of your queries regarding not only stump grinding, however the safe removal of trees and methods to clean up the site when they are done. How Deep Can You Grind? Why Can’t you Dig Deeper? What Happens After You’ve Ground Out The Stump? Standard regulations state that you may only grind a stump 200-300mm below the surrounding ground level. This has just as much to do with the size of the equipment and the blade of the grinder as it does the stump itself. Larger stumps take longer and cost more, as more time and labour is required to grind the stump. The blade is only so big, so little chunks need to be removed, for the safety of both the operator and the maintenance of the equipment. Why Can’t You Grind Deeper? Surrounding services, such as local water lines, power lines and amenity sources run in the ground, often not obvious to the property owner. These can be damaged if cutting equipment runs too close to them. 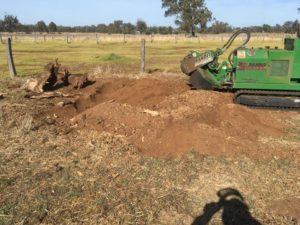 Footpaths can be damaged if a stump is located at the front of a property, not to mention garden beds and fences that can be costly to replace if damaged by the vibration of large machinery or blades. Armac prides itself on their ability to leave a site like it’s never had a tree there at all. The stump is mulched and the hole is filled, the ground is levelled and work area is left clear and ready for new garden dreams to come true. For a small additional cost, the mulch created from grinding the stump can be removed. Who Can Help Me Remove A Large Stump? Armac are your experts in stump removal in the South West. Local specialists operating under strict safety guidelines and standards, Armac are reliable and professional, with competitive pricing and a range of yard services to satisfy all of your needs. For a free quote, phone Ray on 0448 442 477 today.